Ice paint is a favorite in our house. We have tried many different techniques and types of paint. 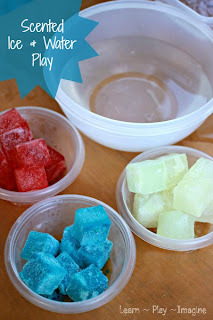 The easiest way to make ice paint is by freezing tempura paint in an ice cube tray. I prefer to water the paint down to save money. I have made ice paint with pure paint and with as much as 50% water, and the colors are every bit as vibrant with water added. Ice paint is perfect for summer fun. You can stay cool while creating art. Ice paint is fun in single colors if you are limited on time, and we also love making multicolored ice paint. Making multicolored ice paint is every bit as simple as making solid ice paints. It just requires more time. Directions: Fill ice cube trays 1/3 of the way with your color of choice. As I mentioned I water it down, so I mix the paint and water in a measuring cup with a spout then pour it into the ice cube tray. I leave the paint in the ice cube tray to freeze. Once it is solid I add the second color and leave it to freeze. Then I add the third color and freeze. I enjoy experimenting with different color combos. Ice paint works well on thick paper. I also like giving my boys towels to use as a canvas. Since I use washable paint the towels wash clean for use another day. Leave the paint cubes out for a short while before painting, otherwise they stick to the towels. See what I mean? Beautiful, vibrant colors. We also like experimenting with water and ice paints. The boys like to dip their ice cubes into a bit of water before pressing onto the towels. I will admit, I enjoyed running the melting ice cubes through my hands as they fell into the water. 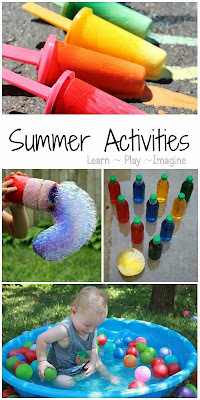 Such a simple idea for summer fun that stimulates the senses. The mix of colors as they melted delighted J-Bug. He ran the melting cubes along the side of the play pool and painted all over. Eventually the water turned green, and he got lost inside his imagination and created all kinds of adventures. First he was in a swamp trying to escape from alligators. Then he was a pirate who ruled the green lagoon. I just love the way his mind works. Since paint isn't particularly cheap, the next time he asked to bring the ice paint into the play pool I suggested using less water to extend the sensory activity. This time we added the ice paints first before mixing in a small amount of water. J-Bug grabbed a container to scoop up water and ice cubes and watch the colors mix. Sensory play with colored water never gets old. The nice thing about using less water this time was that the ice melted much slower, so the sensory activity was extended. For more ways to paint with ice follow me on Pinterest. Just saw this on Pinterest. What a very cool idea! Can't wait to try it! What a fun idea! Shared your idea in a collection post here http://siayla.blogspot.ca/2014/02/got-paint-try-painting-with-out-typical.html I think I used a couple of your ideas...just to let you know.